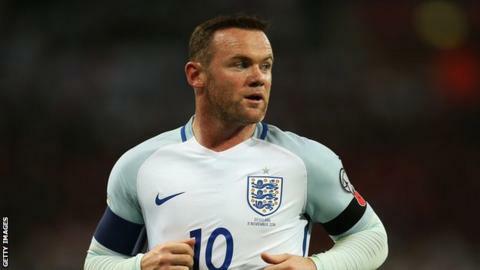 Wayne Rooney has claimed the media's reaction to him attending the wedding reception has been "disgraceful"
Captain Wayne Rooney will not face disciplinary action following his late-night conduct while on England duty. The Manchester United striker apologised over "inappropriate" pictures of him at the team hotel a day after the victory over Scotland. The Mirror report that the FA accept he did not attend a wedding party, but was approached by wedding guests in the hotel, and that no curfew had been set. He has been assured from "high levels within the FA" he will not be charged. An investigation followed the publication of images in The Sun which it said showed Rooney drunk at a party late on Saturday, 12 November. The FA is also looking into claims several England players were out until late on the same Saturday night after the 3-0 win over Scotland - less than three days before they drew 2-2 with Spain in a friendly. England's players all reported back at 11:00 GMT on the Sunday as they were instructed to, and attended training in the afternoon. England players have since been banned by the FA from having nights out while on international duty.